Status Override? 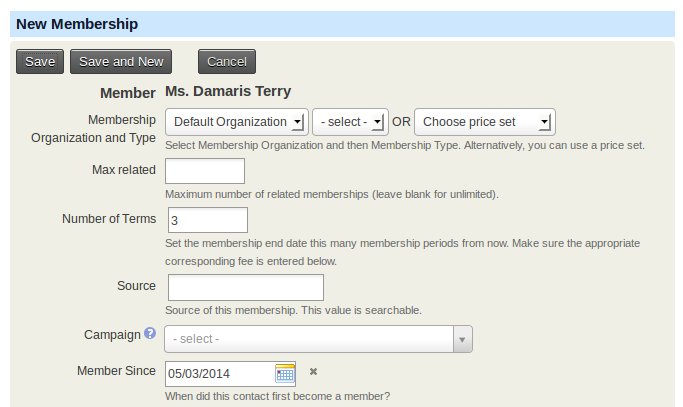 : check this box to manually define a status for the membership record. As indicated by the title, it overrides the status automatically provided. You should use caution with this field as setting it will stop the status from automatically updating based on the membership status rules you have set up (see the chapter Defining memberships). Receipt From: select the email address the confirmation receipt is from. If the email address you want to use is not listed, you can add it by going toMailings > From Emails. Receipt Message:you can enter text here to send a special message to the member. If you don't enter text, the default confirmation and receipt message will be used. To manually create a membership that will auto-renew go to the contact's summary screen, select the Membershipstab and click on Submit Credit Card Membership. If you select a Membership Type that is set up for recurring, a checkbox labelled Membership renewed automatically will be exposed. You can read more details about the Batch Entry of Contributions or Membership Payments feature in the Set-Up chapter of the Contributions section. You should read the Importing Data chapter in the Common Workflows section, before you begin importing memberships since this gives lots of relevant general information. Here are a few details specific to membership importing that you should be familiar with.